I always like soupy food, be it noodle soup, herbal soup or steamboat. My family always have steamboat for Chinese New Year reunion dinner. I love steamboat because it’s a healthier choice of course it’s soupy. Few weeks ago, I had a scrumptious Oriental Steamboat @ Celestial Court, Sheraton Imperial Kuala Lumpur Hotel. I love their signature Lui Yee Hung broth. Steamboat is also known as ‘hot pot’, refers to several East Asian varieties of stew that comes with different flavours of broth where different ingredients are placed into the pot to be cooked. 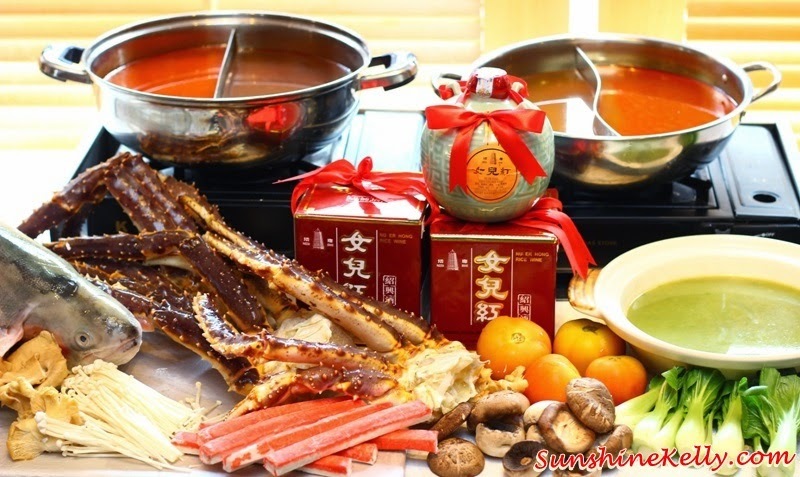 The “All Steamed Up – Oriental Steamboat” at Celestial Court offers a delectable steamboat specialties accompanied by 5 unique Celestial Court’s signature broths. ‘Lui Yee Hung’ - Chinese Wine with Cordyceps Herbal Soup; made of glutinous rice and wheat, this wine evolved from the Shaoxing tradition of burying it underground upon the birth of a daughter, and serving it at the wedding of the daughter. Jade Porridge – porridge based vegetarian broth with a blend of spinach, which is claimed to strengthen the bones, nourishes the eyes and contains anti-cancer and anti-inflammatory antioxidants. Hot Slipper Lobster Soup – a fusion of slipper lobster based broth and ‘ma la’ sauce, an ideal soup for those who are looking for something flavourful and numbingly spicy. This broth taste like prawn mee soup, it’s quite spicy and bit salty for me. ‘Thai’ Tom Yam Soup if you prefer a tangy and spicy twist. Tom Yam broth is quite common. But its appetizing when you have lots of seafood in it. Chicken Ginseng Soup for diners who prefer something traditional and subtle. This is my second choice. The ginseng soup taste not too strong, moderate and goes well with the meat like chicken, lamb or beef. Of the 5 signature broths, I like the Lui Yee Hung the most. It’s like Chinese Herbal Soap with a hint of Shaoxing rice wine. The broth has the original sweetness off the ingredients and very appetizing. It warms my tummy. If you are going there do try the Lui Yee Hung broth. After steamboat we also ordered some desserts to share like Chilled Osmanthus Jelly with Honey Sea Coconut & Praline and Chilled Herbal Jelly. I prefer the Herbal Jelly as its not sweet and cooling. Just right for my throat after the steamboat. A la carte orders will also be available and will be priced from RM19++ onwards per portion. You can also try their King Crab and Tasmanian Ocean Petuna Fish specialties at RM30++ per 100 gram and RM25++ per 100 gram respectively. This Oriental Steamboat promotion is available for dinner from 1 August to 30 December 2014. Set menus are available (for a minimum of two persons each) with a choice of vegetarian Mushroom Set priced at RM49.90++ per set, Poultry Set priced at RM55.50++ per set and Seafood Set priced at RM68.80++ per set. Lots of delicious and healthy recipe. All of ingredients of these recipes are useful for our health. Thanks to share such type of nice recipes.